Welcome to our gallery of exotic pool cabana ideas. 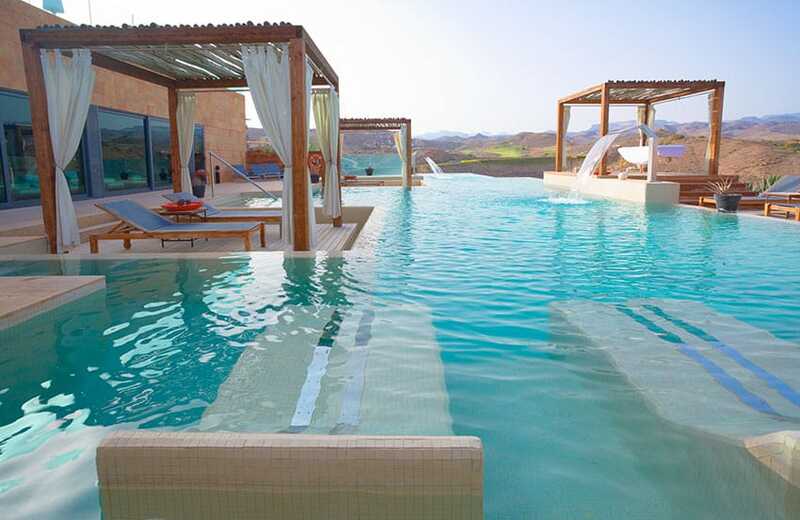 A swimming pool can be a great place for relaxation and fun. However, it’s important to also have a retreat where you can shade yourself for the sun or just relax poolside in ultimate luxury. With the addition of a cabana you can create an outdoor living area for entertaining and providing maximum comfort. Below you’ll find some popular pool cabana designs for inspiration to create your own backyard oasis. Pool cabanas are a functional and practical addition to any poolside setting. Aside from being an attractive focal point for a house’s landscape, pool cabanas offer a number of functions. By definition, a pool cabana is a hut, cabin or tent-like structure that is made up of light weight walls or supports with one side facing the pool. It may be a permanent structure with walls or a temporary collapsible structure such as a tent or umbrella. Its average size is usually 8 feet x 12 feet or 10 feet by 14 feet, although this is not a rule that needs to be followed strictly in terms of construction. Pool cabanas may vary in size depending on the intended purpose. Pool cabanas are usually used as a place to take shelter from the sun, rest between swims, change in and out of swimming attire or entertain guests. It is also sometimes used as a storage for pool equipment. Another benefit that it gives is that it avoids the flow of wet traffic within the home as it allows a convenient ease of access from the pool. Since it is adjacent to any swimming pool, it provides guests or homeowners a place to dry up before entering the house. 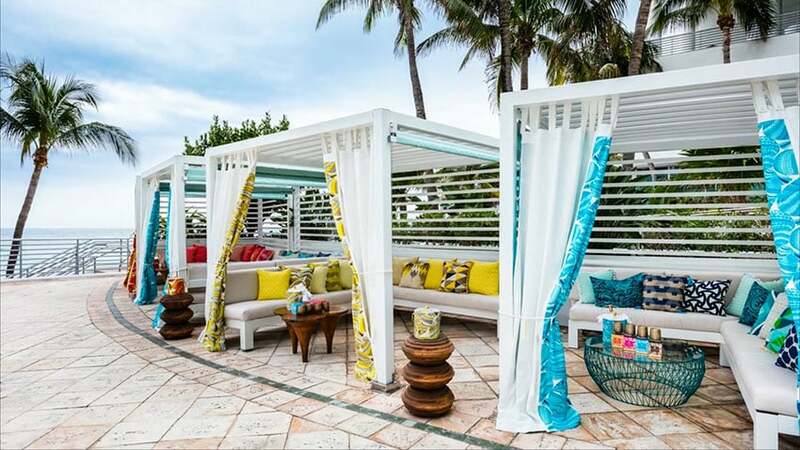 Function – The cabana is a multipurpose amenity which serves a lot of functions. 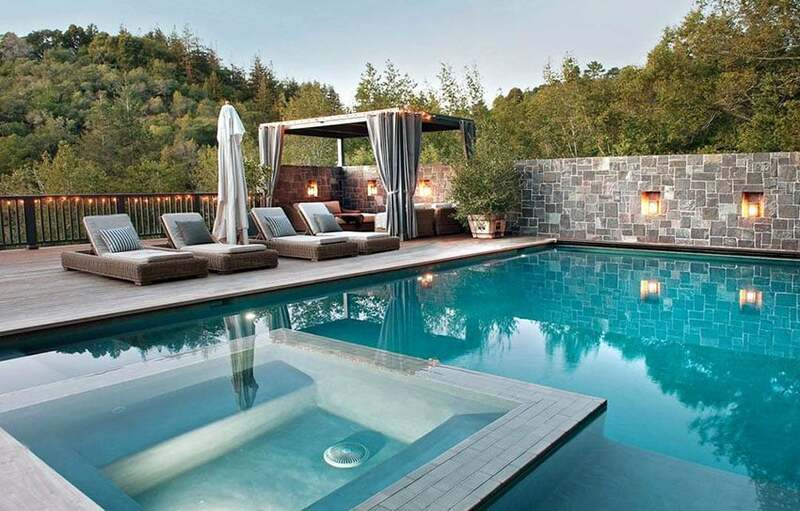 In designing a pool cabana, determine what or how do you intend to use it for. This will also dictate the size of the structure you will be needing and the items that will be placed inside your cabana. Will it be used for simply rest and relaxation? Will it be used to store pool equipment? Will guests be entertained in this area? What activities will be done in this area? Size – The size of your pool cabana must be sufficient to meet your needs. 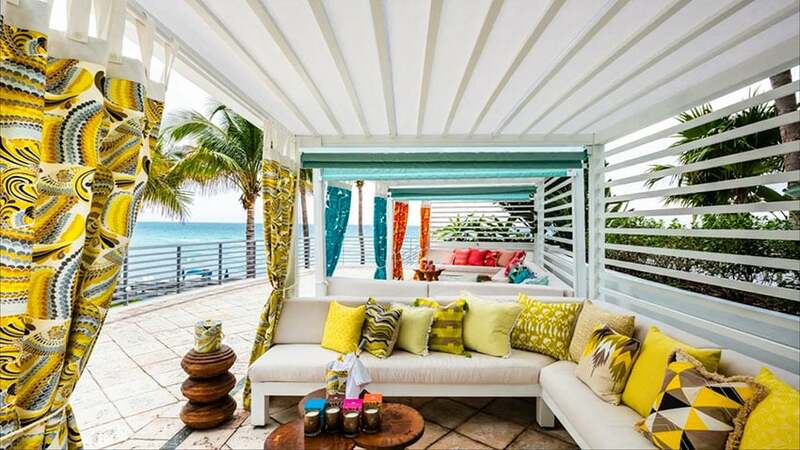 For example, if you intend to entertain guests or dine with family, make sure that your cabana is large enough to accommodate dining chairs and tables. 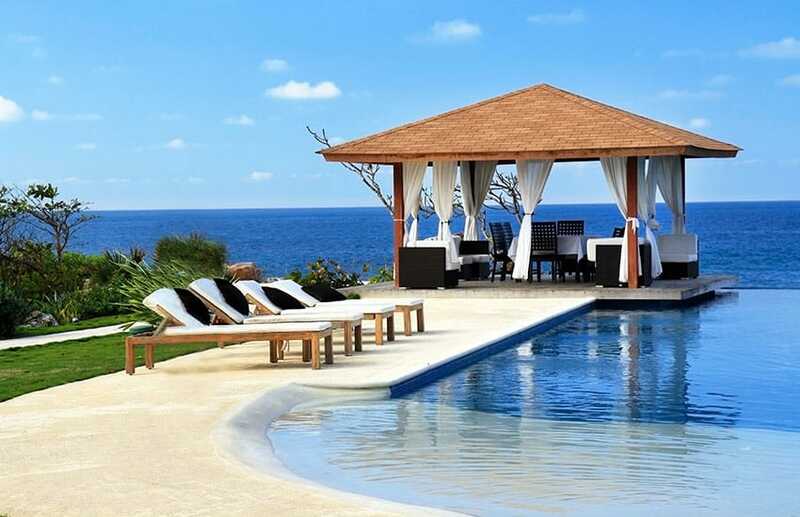 Location – A pool cabana must essentially be located within close distance to the swimming pool. Also, strategically place it within your backyard. Determine whether you want to use it as a focal point or whether you want it to blend within the landscape. 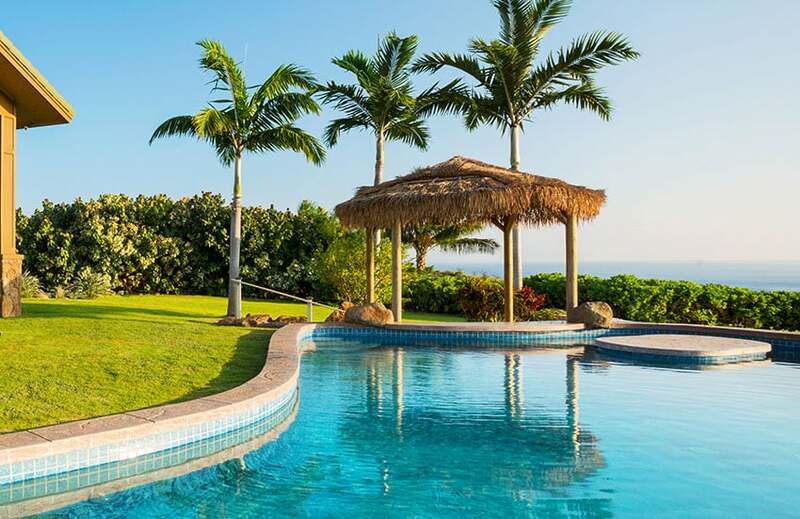 Plumbing and electricity – Again, this will be dictated by the function of the pool cabana. If it is intended to be used as for gatherings such as occasional barbecues, parties or family dinner then a kitchen or grilling station would come in very handy. Appliances would of course be needing power supply so electrical planning need to be considered. Plumbing works, on the other hand, will be required if there is a need for a sink, restroom or shower area. Natural Lighting – Since it is a place to take shelter from the sun, consider soft treatments such as curtains, shades or drapes in your design to block off sunlight. Landscape – Cultivate the surrounding environment of your pool cabana. Incorporate plants, design it within your landscape or add decorative elements such as a trellis or a cupola. 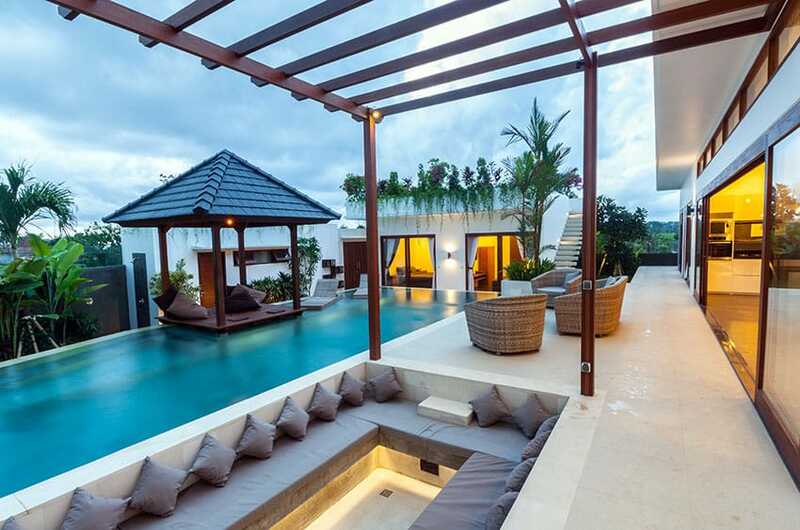 Style – Any pool cabana can be designed according to what you prefer, whether it may be Asian inspired, Tropical themed, Bohemian, Contemporary or Modern. The chosen style will also help you determine the type of materials that you can use for the roofing and posts of the structure. 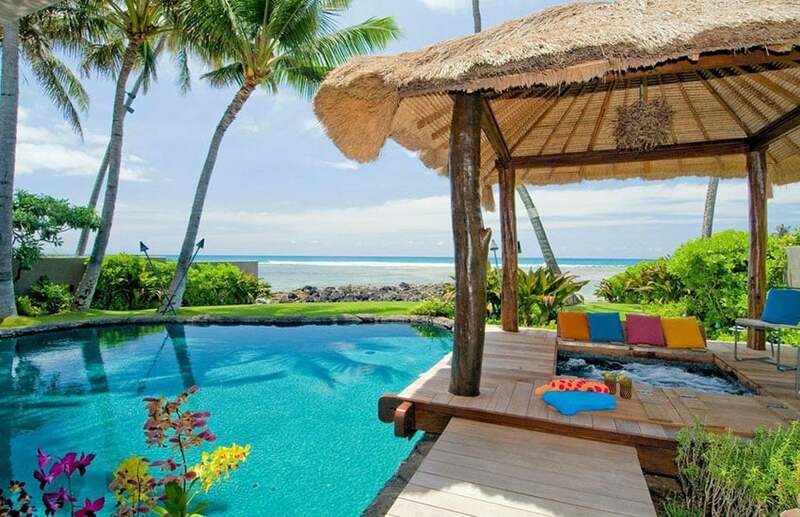 A tropical inspired cabana, for example, would require thatched straw roofing. A simple wooden trellis would work well for a contemporary style. 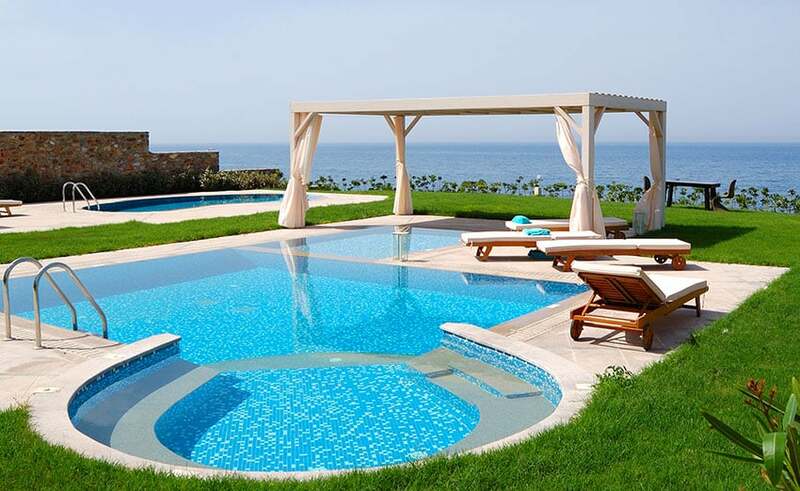 Materials – Pool cabanas are constantly exposed to changes in weather and high moisture content. Materials for both interior and exterior finishes should be able to withstand these factors. For the roofing, some of the options are shingles, wood, metal, polycarbonate sheets, fabric or thatched straw. Flooring must be water resistant non slip flooring such as treated deck wood, ceramic or stone tiles. Waterproof and treated fabric which can be used as curtains are also available in the market. For the furniture, the most common outdoor furniture are rattan, metal, plastic or faux leather upholstery. Furniture – Pool cabanas are usually furnished with a piece of upholstered loose cushion which allows for resting or sleeping. Another common poolside furniture is the lounge chair which works perfectly for reclining. Multipurpose furniture with storage are also an an ideal addition to pool cabanas because it gives you a place to store valuables, towels or sunscreen. If necessary, the amount of seating may be increased depending on the number of users. Additional accessories such as hooks or shelves may also be added for small items. 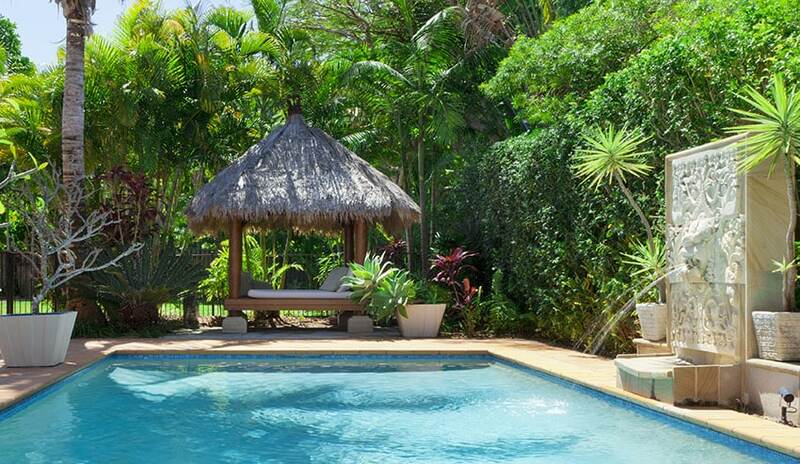 Exotic pool cabanas are a well loved choice for their design and style. Reminiscent of the beach, island living and the tropics, exotic pool cabanas provide a perfect place for rest and relaxation at the comfort of your own home. Truly, a well designed pool setting allows you to enjoy resort living. 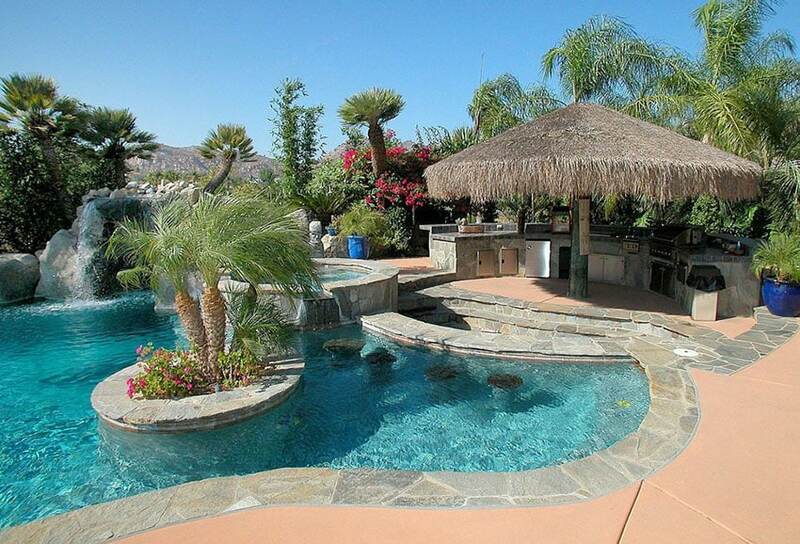 Below is our gallery of exotic pool cabana ideas. An open cabana situated in a ledge within the pool provides a place to rest and relax during swimming breaks. The four open walls also maximizes ventilation within the structure. Another unique way to design your pool cabana is to furnish a recessed floor with cushions and pillows. To make the setting more cozy, add warm white cove lighting below the seats. This serves a perfect place to entertain friends or bond with the family. For this tropical inspired setting, the pool cabana is furnished with a thatched roof, wooden posts and sheer white curtains. A loose cushion is also a practical addition not only because of its function but because it is also easier to maintain and clean. In this case, the orange cushions instantly liven up the space by adding contrast to the neutral color of the drapes. 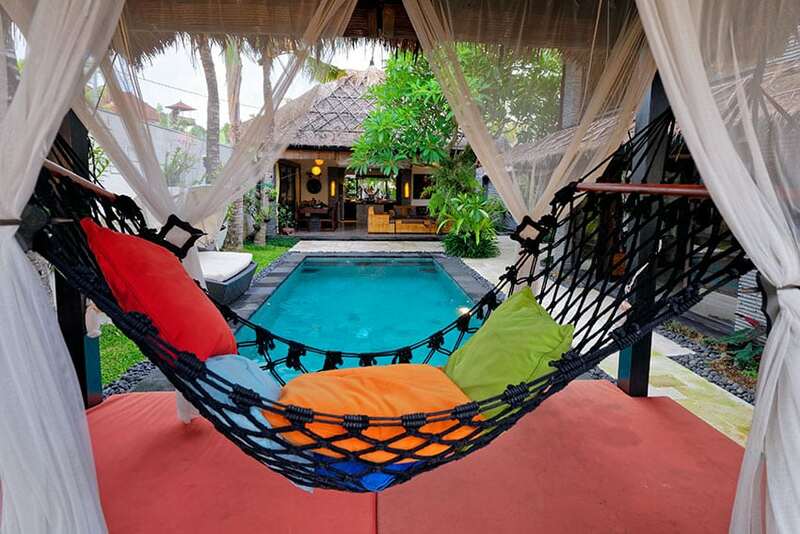 Add a hammock to your pool cabana if you want a place to chill, read a book or even enjoy a nap. 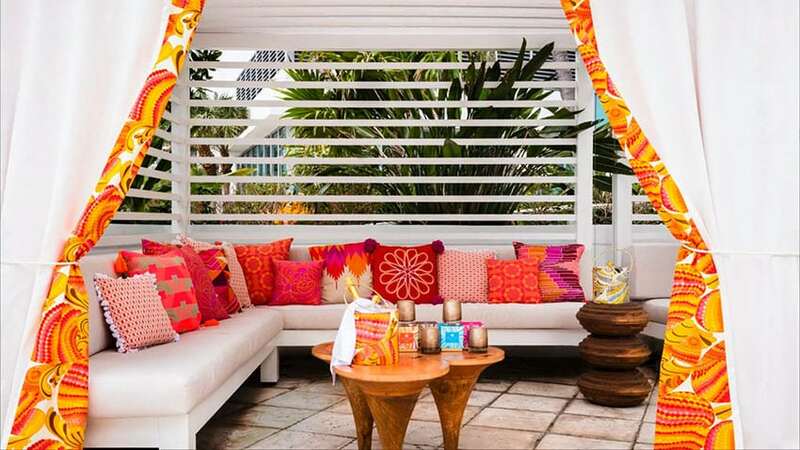 The addition of bright colored pillows add a pop of color creating a lively and fun ambiance. Pool cabana ideas should start with your personal sense of style to create a place for your ultimate comfort and enjoyment. This pool cabana is situated within the edge of an infinity pool and is a perfect spot to enjoy the view of the surrounding beach. Simple yet elegant, the wooden roof and white curtains evoke a clean airy feel. Furnished with a dining table and arm chairs, it also serves as a space to gather with friends or family. This pool cabana is strategically placed as it covers an entire view of the pool and the living and dining areas of the house. The use of woven rattan chairs do not only complement the Asian inspired theme of the house but is also a practical material for outdoor furniture as it can withstand weather changes and exposure to moisture. A simple cabana design consisted of a four poster structure with a thatched straw roof. This is design at its simplest form yet is very functional in terms of providing shelter from the sun. This type of cabana is also versatile and flexible as it provides more design options according to the specific need of the users. For example, if you are planning to set a pool party, furnish it with some chairs and a table. This luxurious swimming pool is surrounded by wood decking and hosts a large curtained cabana with out door furniture. A large stone privacy wall with light alcoves creates a unique ambiance as night falls. Similar to the one pictured above, this pool cabana is also a four poster structure with a thatched straw roof but its flooring is raised to for seating or lounging. This type of cabana design is perfect for tropical themed houses. 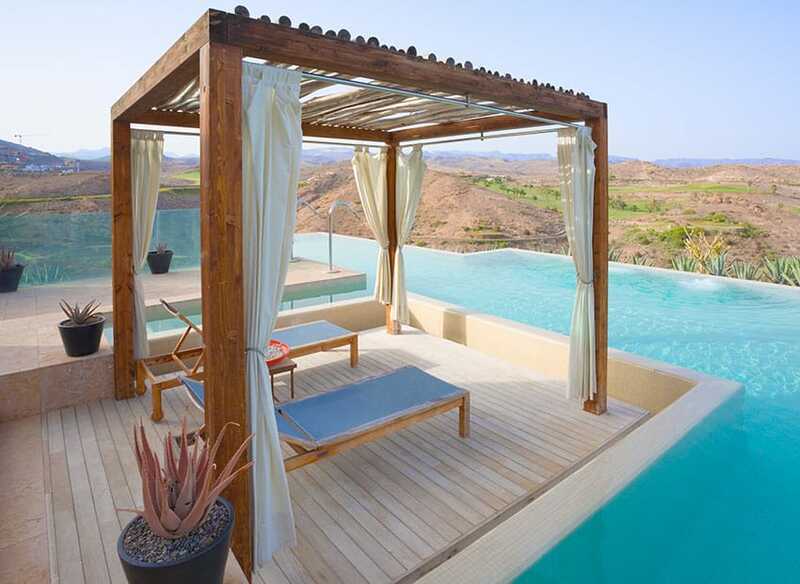 Minimal, simple and clean, this type of cabana design makes use of four posts and a flat roof. The drapes tied to the posts may be spread out as protection or shade from the sun. 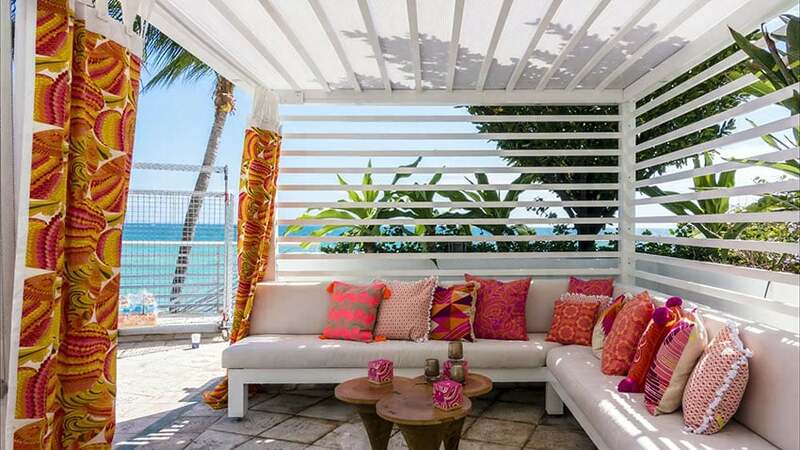 Printed pillows and curtains add a splash of color to this all white pool cabana. It is made up of horizontal wooden slats and a flat roof. This look captures a bohemian inspired style which is perfect for beach houses. 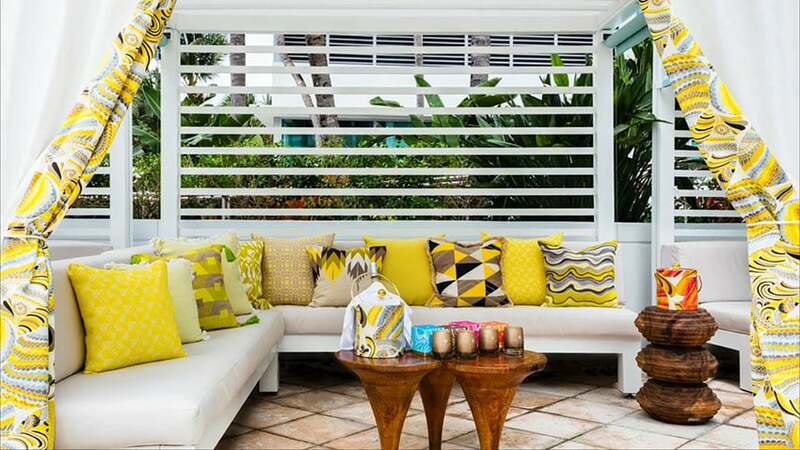 Another take on the bohemian inspired pool cabana, but with shades of yellow, mustard and muted grayish browns. This accent color provides warmth and evokes a “summer feel”. Opt to add a center table where you can put down drinks, snacks or small items. The design above made use of an interesting piece which serves as the unique focal point of the space. The design made use of blue accent pillows and curtains in assorted geometric patterns. This cool hue represents the color of the ocean and evokes a feeling of calmness and it soothes the mind. It is the perfect color for rest and relaxation. The horizontal wooden slats add character to the space while maintaining the open plan. They are both decorative and functional. 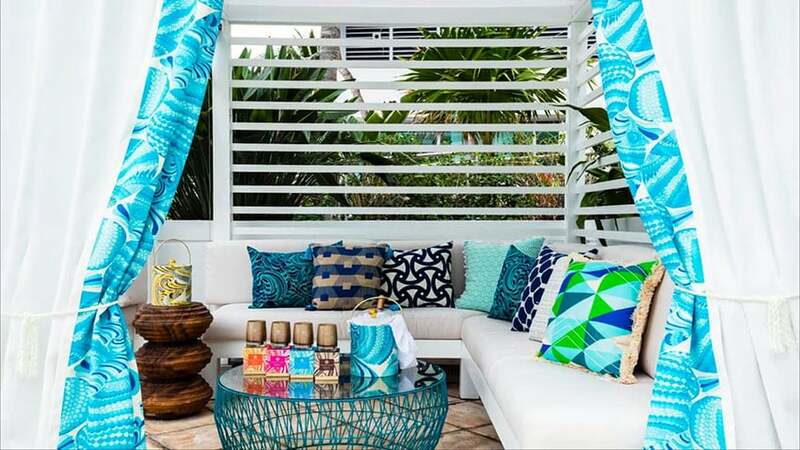 Add interesting accent pieces as you style your pool cabana. In this case, the ice bucket has a similar design pattern with the curtains. 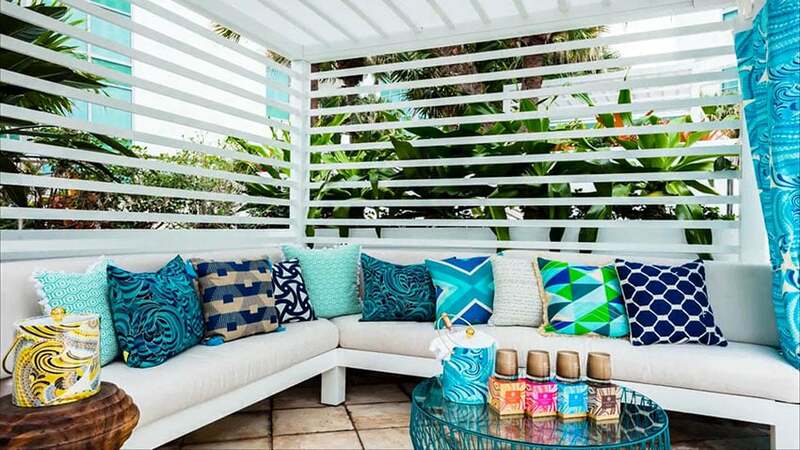 Pay attention to small details when you accessorize and style your pool cabana as it creates a big impact in the design. Pool cabanas may be constructed in a series. Add variation by using a different accent color for each. This type of design is dual purpose — leave the curtains open for group gatherings or simply close off the curtains for privacy. Sheer curtains allow minimal light to pass through and provide privacy. Even an “all white look” works well for an outdoor setting, just make sure to use the right type of fabric for the furniture upholstery. Waterproof fabric repels moisture and will withstand the exposure to changing temperature, humidity and weather. If you want an upgrade, convert your pool cabana into a pool house with complete amenities. 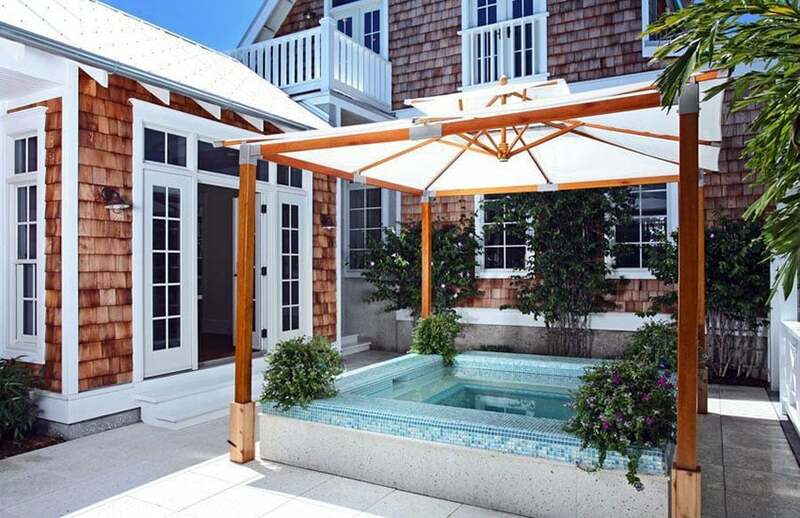 This pool cabana is enclosed with three walls and shingle roofing. It is furnished with a dining area, living area, kitchen and a fireplace. If the space permits, a TV may be added to the space where you can enjoy movies. Many pool cabana ideas seek to bring all of the amenities of indoors to the backyard to provide a luxurious outdoor living area. This pool cabana is stocked with all the essentials with an outdoor kitchen, wet bar with sitting area, fireplace and outdoor lounge area complete with plenty of seating. A portable metal gazebo can be an effective way to create a cabana experience. 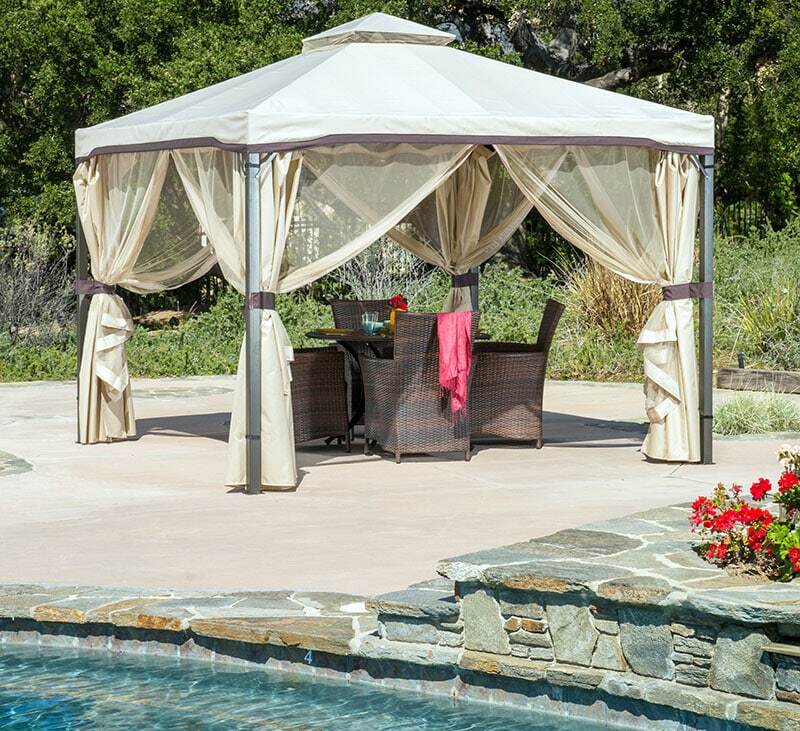 The portable gazebo shown above can provide shade for outdoor dining or just as easily be used for lounge chairs or a daybed. A pool cabana may also be fixed with a hot tub, Jacuzzi or whirlpool bath. 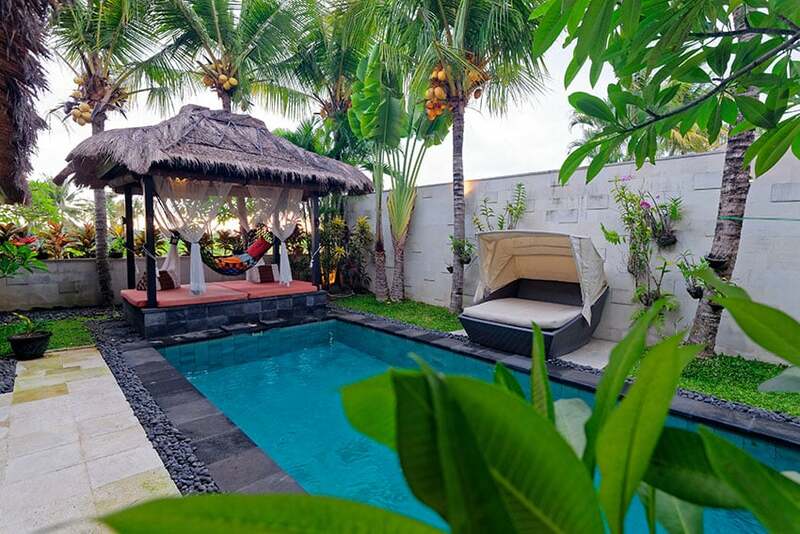 Adjacent to the main swimming pool, this is a relaxing shaded spot to take a dip while enjoying drinks. This type of design made use of wooden floors, solid wood posts and woven straw roof which is perfect for an Island Tropical themed house. 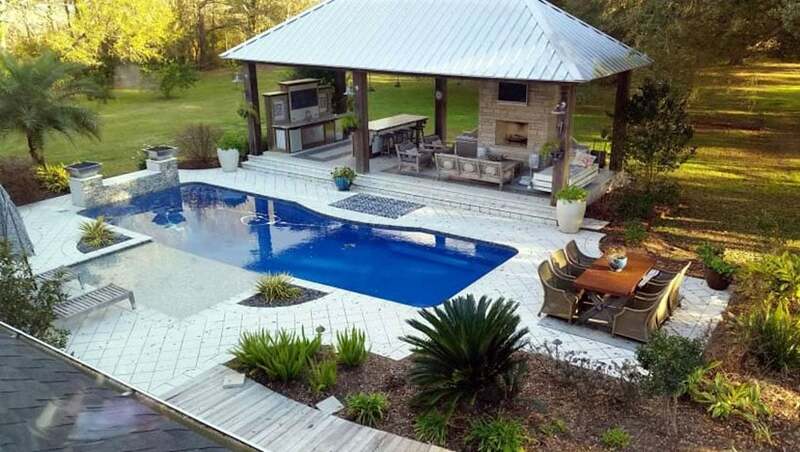 Another pool cabana design which is similar to a gazebo covering a hot tub. To soften the design, add plants along each corner of the structure. If the backyard or lot is big enough, the adjacent buildings to a pool may also be a small guest house with complete amenities. 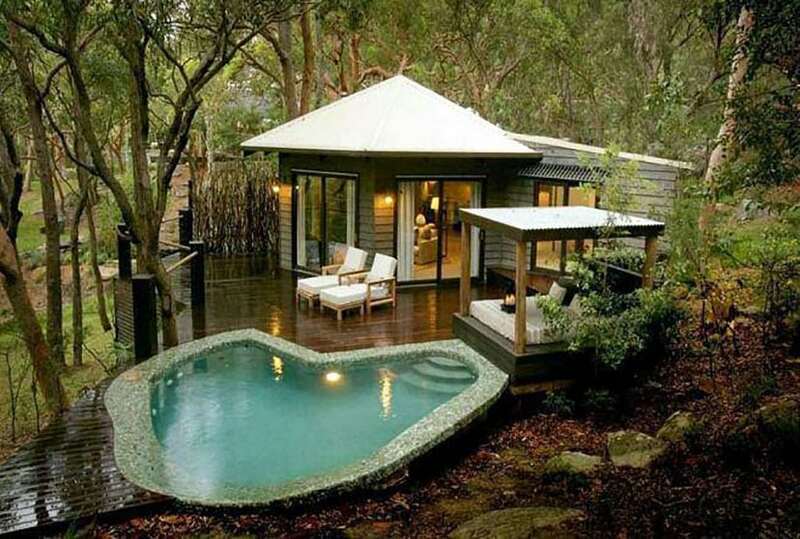 In this design, the pool cabana is a very simple structure with raised flooring, flat roof and a mattress. It blends well with the surrounding environment. A wide array of outdoor and weatherproof furniture is also available in the market. With smart mechanisms and hardware, most of these furniture are usually reclinable and can be used for lounging or sleeping. It is also comes in different fabric and upholstery materials which can stand the wear and tear of everyday use. In this design, the pool cabana is a simple metal structure with plain white curtains which is used to cover the seats. Other ready made outdoor furniture also comes with fixed posts where drapes can be hung to provide privacy and shade. They also provide multiple purposes as seating and storage. In this case there is no need to construct a separate structure for the roof. The modular design of the daybed allows for a variety of configurations, for sitting with your loved one or while sunbathing. 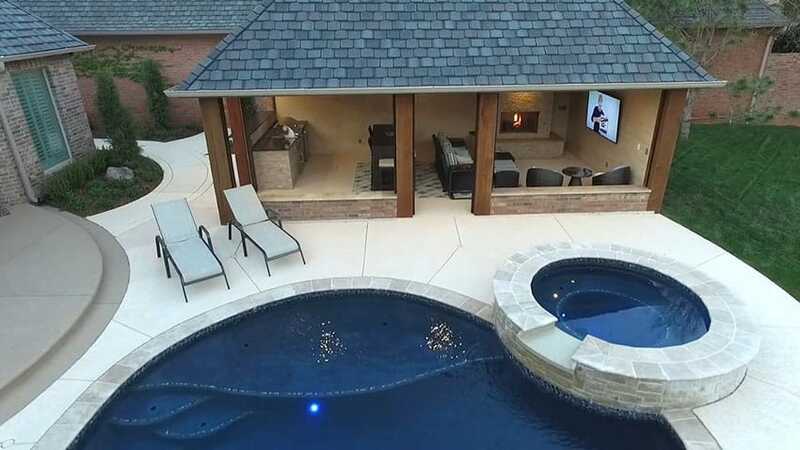 The pool cabana may also be consisted a small outdoor kitchen or a grilling area wherein the family can enjoy barbecues and parties with guests. To make the entirety of the design cohesive, the stone used as the accent for the floor is also used to finish the kitchen counters. this type of material works well for outdoors as it does not require maintenance, is very durable and slip resistant.